Yesterday, Facebook announced upgrades to their mobile application’s Nearby functionality for both the iPhone and Android. 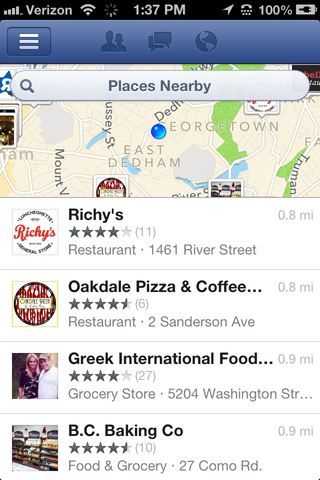 This upgrade now positions Facebook’s mobile app much closer to Foursquare’s recent local recommendation terrain, as users can search and find local businesses to visit, based on their proximity, by name or category. 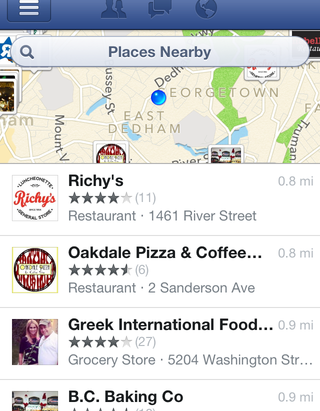 In addition to enhancing the application’s local discovery functions, Facebook’s Nearby also now comes with a 5 star ratings system for local businesses that is noticeably comparable Foursquare’s recent 10 point rating system. So what does this mean for hotels and restaurants? Well, if your business doesn’t have a Facebook page, you simply won’t be searchable in Facebook’s mobile app feature which, according to Facebook, has a user audience of over 600 million. Compare these numbers with Foursquare’s audience of 30 million mobile users, and a concerted effort to focus on optimizing your page’s profile information is imperative. With nearly 70 percent of Facebook’s 13 million existing Business Pages inactive, there is a terrific opportunity to stay ahead of your competition and ensure social, location and mobile (SoLoMo) visibility within the application. By clicking on the “Nearby” tab in your Facebook mobile application, you will be taken to a “Places Nearby” landing page, where a map of your current location plotted with local businesses listed. These local businesses are categorized and are searchable by: restaurant, coffee venue, nightlife, outdoors, arts, hotel and shopping. The venues that immediately populate on the screen are ordered by proximity and are only listings where other Facebook users have checked in. If any of your friends have “liked” or checked-in via Facebook at one of those locations, that place will be listed higher in your search results. Update Your About Section: For hotels, this section must include all of your basic information (phone number, physical address, email address, description of your property and general facility information) as well as the all important website link. Be sure that this website link direct users to your mobility-optimized website so that you don’t miss the opportunity to capture more mobile traffic to your site. For restaurants, the same basic information from above applies, as well as ensuring hours of operation, price range, specialties, attire, services, and payment options are all up-to-date. While these categories do not differ from your desktop-accessible Facebook Business Page, they’re important to review as the likelihood of receiving a positive rating may be contingent on these basic pieces of information. Encourage Ratings & Reviews: As is the case with every social media and online reputation management practice, the best way to generate more interest in your business is simply by asking. Don’t shy away from encouraging your consumers to like, check into, rate, and recommend your place. Like TripAdvisor, these ratings can have a significant impact on the consumer’s likelihood to visit your establishment, as they are prominently displayed directly on the landing page of the business listing. 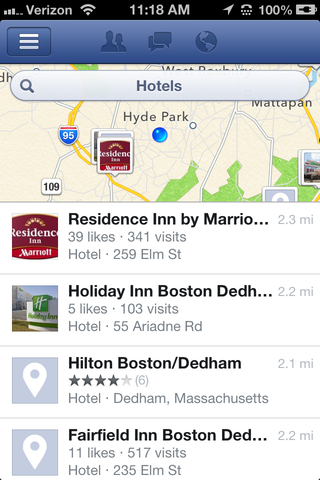 If you find your hotel or restaurant is on Facebook Nearby but has not been merged with your brand’s Facebook Business Page, OR is simply not showing up on Nearby at all, do not fear! To remedy this dilemma, Facebook offers a great couple of resources to help assist with this issue. So let the Facebook updating begin! Let us know how much progress you’re making and let us know if you’re having any problems by hitting us up on Twitter!